Whoa. That was some heavy-duty holistic workshop tonight. We covered a huge array of topics, and ended the evening by packing jars with homemade cultured veggies (which, methinks, I will write about in due time, on this very blog). Overall, I really enjoyed the course, especially since we’ll be taking the changes slowly, and one at a time. Homework this week: eating without distractions. Rather than bore you all with the minutiae of my diet/lifestyle/meditation/life overhaul program every week, I’ve decided that in future I’ll just add a little coda at the end of whichever post happens to follow my classes. But for today, I’d like to provide a general sense of the core principles we covered. And to do that, I’m going to tell a little story, one that spans the gamut from the ridiculous to the sublime. Once upon a time, when I first started teaching, I knew exactly one person who was vegan. As someone who’d done some minimal reading about different diets, I understood what “vegan” meant, but had never actually met one of the species in the flesh (no pun intended). But Ms. X was very hip and very cool (sporting both bleached blonde, spiky hair and faux-leather corsets–those were the days just on the heels of Madonna’s pointy bra, after all), so I screwed up my courage and invited her and her dark, brooding boyfriend to dinner. I have to give them credit for actually eating what I served. It’s not that any of it was particularly distasteful on its own–I did know how to cook, after all–but I threw together such a hodge-podge of disparate dishes (based solely on the fact that each was devoid of animal products) that the menu was fairly, shall we say, “eclectic.” It was a situation reminiscent of one my former friend M used to describe to me: often, when acquaintances first heard he was gay, they’d burst out, “Oh, I know another gay guy! Why don’t I fix you up with him!” (assuming, of course, that their shared sexual orientation would, on its own, give rise to an immediate and eternal love affair). Well, that’s how I treated my vegan dishes that evening, I’m sorry to say. Ever had kasha-stuffed samosas alongside mango and curry rice, with sweet and sour carrot/parsnip patties? Oh, and with a side of guacamole? Well, I have. And it wasn’t pretty, trust me. 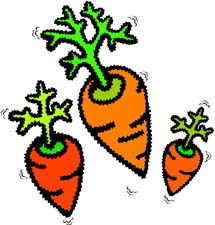 Well, apart from giving me nightmares about carrots suffocating in plastic bags, carrots crammed one on top of the other into too-small cartons, baby carrots being clubbed to death, etc.–Ms. X did introduce the notion that we could all stand to be a bit more mindful of what we put into our bodies. And during our course this evening, we discussed this very issue at some length (though not in the same terms as Ms. X’s lament). As we know, all living things (and this would include plants) emit an energy field; and recent new-agey theories focus quite directly on the impact our own “energy” has on the outcome of our lives (as in, “the intention you set will influence the outcome you achieve,” for those of you who’ve seen or read The Secret). Then there are also Emoto’s amazing studies on the effects of energy on water, etcetera. On a more pragmatic level, is it possible the energy in our food has an impact on us? Well, said my teacher tonight, the answer is “yes.” Hence her recommendation to eat without distractions, to notice the food we put into our mouths, and to opt for whole, organic, raw foods whenever possible. Natural nutritionists have long asserted that “dead” foods (such as highly processed or GMO products), being composed to a large degree of chemicals and non-organic materials, harbor no real, “living” nutrients, and so can’t, in any meaningful sense, nourish us. That’s why we can gorge on various fast foods and pre-packaged foods, yet still remain hungry even after consuming massive quantities of them. In the end, it may behoove us to treat our orange roots with a little more consideration, but it’s these non-foods that should really incite fear instead. And so, my prescription from this evening’s class was fairly clear (apologies to Michael Pollan): Eat plants. Many raw. Not much else. I’ll do my best, but I can’t promise. In the meantime, I’ll still be preparing “regular” dishes and will continue to post about them on the blog (and when I cook something with fearsome ingredients, I’ll attempt to restrict my intake to tiny nibbles). Tonight’s coda: A few years after our inauspicious dinner, Ms. X got pregnant. During those nine months, “for the health of the baby,” she returned to eating meat, and continued to do so after the baby was born. She was still eating animal products up until we lost touch about a decade ago. I have no idea about carrots, though. I was surprised at the coda – thought Mrs X might have become a fruitarian rather than an omnivore – maybe she thought that there was no escaping the fear! Wasn’t there a Roald Dahl short story about a man who invented a machine that meant he could hear what plants were saying and he went a little crazy hearing them??? Intense class session!! I would have been rather overwhelmed by all that information, haha. I was surprised at the coda, too! And I had to look up that story–it’s called “The Sound Machine” and it does, indeed, concern a scientist who invented a machine that emits the sounds plant life make when we injure them! It could drive one crazy if, after all, there were nothing left we could eat with a clear conscience! Pretty intense, yes–but hopefully, some of it will sink in for me! Now I’m off to have some raw plant foods (and ignore any whining I hear in the process). Great story Ricki. I’m not at all surprised by the coda. After such intense dietary restriction, it’s little wonder she enjoyed the food freedoms during pregnancy. I know a number of once hard-core vegans who are now rampant meat-eaters. But I like the eating mindfully exercise. It’s something I talk to clients about a lot. So often we just stuff the food in, while doing something else – watching TV, checking emails, reading, driving. Like the practical nature of your course – look forward to reading more about it. I try to cook mindfully – there’s a great little book called…(pauses to run downstairs and check shelf)…The Mindful Cook by Isaac Cronin that’s full of interesting mindful excercises. I clear all the benchtops, wash up, dry and put it all away before I begin. It’s quite good. I just need to get to the mindful EATING bit next.